CMC Vellore 2014 Forms are now available - Hurry Apply Online! Application process for CMC Vellore 2014 has now started. 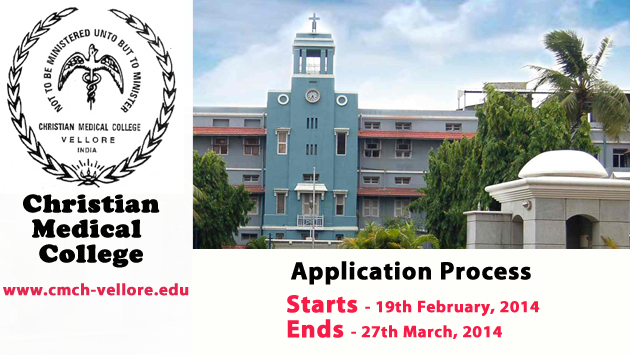 Students seeking admission in any of the Christian Medical College must fill up this form. Application form is available ONLY online. Note: Keep your application number as ID and date of birth as password to download your hall ticket from the website (www.cmch-vellore.edu). Join more than 5,000 students in preparing for CMC Vellore Entrance Test in 2014 on simplylearnt.com. There is no better preparation for Christian Medical College Entrance Exam than reaching Milestone 9 - Nirvana before your exam day.